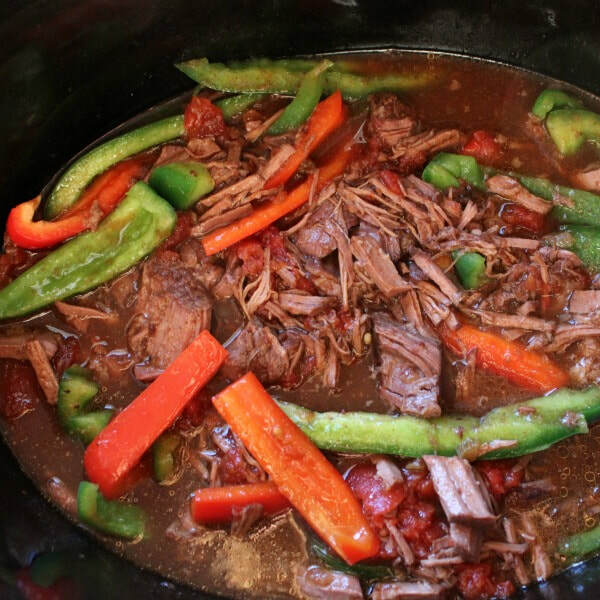 This simple Crock Pot Steak and Peppers takes less than 5 minutes to prepare and is mouthwatering good. Check out this blog post for other easy one-pot meals. Place the steak in the crock pot. Pour the can of stewed tomatoes (with their juice), soy sauce, beef broth, and garlic powder on top. Cook for 3-4 hours on high or 6-8 hours on low. The steak should be falling apart, and the sauce should be slightly thickened. Add the peppers and cook for 15 more minutes or until they start to soften. Serve this delicious mixture over quinoa, brown rice, or whole wheat pasta!